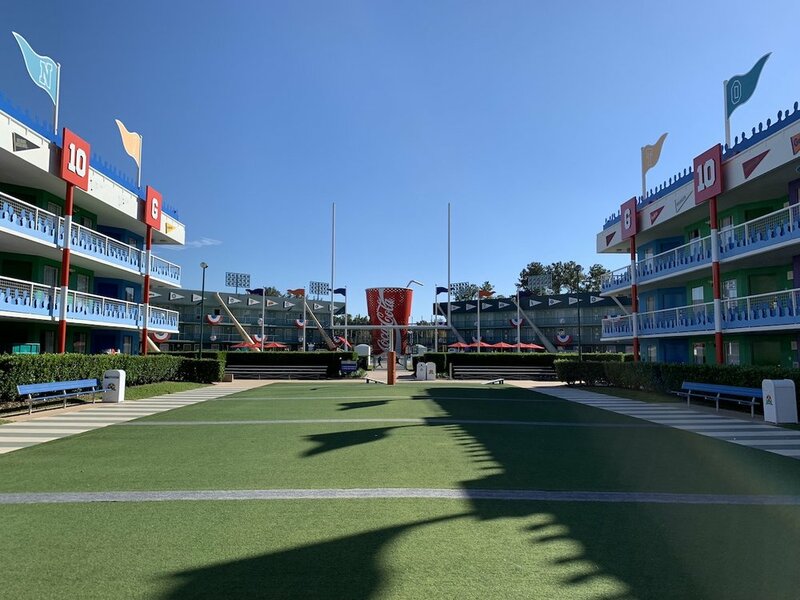 All-Star Sports was the last of the three All-Star Resorts at Walt Disney World we had to review. This hotel often plays host to athletic teams, and is home to some impressive (if not a bit over-the-top) decoration. Read on to learn more about All-Star Sports! All-Star Sports is one of the three All-Star resorts at Walt Disney World (the other two are All-Star Music and All-Star Movies). These are Disney’s lowest-priced value hotels, and they’re all near each other and roughly equivalent in quality. Prices at All-Star Sports in 2019 range from about $112 to $244 nightly. Deal prices can get under $100 per night. All-Star Sports often plays host to teenage athletics teams participating in competitions at Walt Disney World. This is really reason enough to avoid booking it unless you have to. If you absolutely must see the theming—it is fun to see—you can always easily walk over from either of the other two All-Star resorts. The grounds are broken into eleven buildings and two pools. The main building is “Stadium Hall.” That’s where you’ll find reception, the concierge, the Game Point Arcade, Sport Goofy Gifts and Sundries, the End Zone Food Court, and the Grandstand Spirits pool bar. Nearest to Stadium Hall is the Surfboard Bay Pool. Over by the Home Run Hotel buildings is the smaller Grand Slam Pool. Both pools have laundry rooms next to them. As we’ve previously mentioned, “sports” is the least Disney theme of the three All-Star resorts. Music and Movies can latch onto things Disney does well (i.e. animated films and the music in those films). Sports is mostly just…sporty. All-Star Sports also has a full activity schedule. Here’s the January 2019 activity schedule. We needed a place to stay for two nights during the RunDisney Dopey Challenge (we had the other two nights booked), and we had been looking to cross Sports off our list. We contacted our Authorized Disney Vacation Planner, Lauren Quirk of Enchanted Escapes Travel about our required nights. Originally, we booked at the rack rate of $152.38 per night. But when an annual passholder discount became active, Lauren applied it to our room to bring the rack rate down to $141.95 per night—a 7% saving. The value resorts see a lot of variation in pricing depending on where you look. In this case, the lowest we could find on other sites (Priceline, Booking, Expedia, etc.) was around $160. Other times, we’ve seen rates of below $100 on these sites. As always, if you book through a non-Disney site you should be sure to link your reservation to your My Disney Experience account both as a means of confirming it and to be sure you get all the perks associated with your stay. We arrived via bus from Disney Springs (we were doing a split stay and had just left Port Orleans—Riverside). Most guests will arrive via Disney’s Magical Express. We checked in online midday and our room was ready around 2:50PM, which is before the official 3PM check-in time. The All-Star Sports rooms are the lowest priced rooms that haven’t been recently refurbished in Walt Disney World. This puts them at the bottom of the food chain. They’re not awful, honestly. And they aren’t as worn as some other rooms—including at moderate and deluxe resorts—at Walt Disney World.Mostly the room just looks dated. The furniture is the sort of late 90’s stuff you’d find at low-tier hotels. And the decoration, while fun, looks just sort of slapped on. The bathroom is very small and very simple. All that said, besides an insufficient number of well-placed outlets, we don’t have any actual complaints about these rooms. They’re just not as good as the refurbished rooms at Pop Century or All-Star Movies. As always, we’re fans of the cafeteria-style quick service options at the All-Star resorts. Unfortunately, this time we were a little disappointed with the pizza, which seemed a bit lower quality than the other value resorts and didn’t come with a salad. Food court meals are quick service meals under the Disney dining plans. We don’t use the dining plans. Traveling to and from the All-Star resorts, you’ll be relying on buses and rideshare (Uber, Lyft, Minnie Vans). Lines for the All-Star buses can get long, especially as buses are less frequent midday. For Extra Magic Hours, we had little trouble getting on a bus as one double-length bus came, immediately followed by a single bus. Keep in mind that the All-Star resorts often share buses, too, and All-Star Sports is usually first for pickup (longer to get to the parks) and drop-off (shorter getting back from the parks). When it comes to getting to meal reservations or getting to the parks (other than Magic Kingdom) in a pinch, we still favor using Uber. It isn’t a perfect service, but it generally will beat using Disney’s bus services in a pinch. Really, there are limited reasons to stay at All-Star Sports. If the other All-Star Resorts are full and you really can’t work Pop Century or Art of Animation into your budget (or they’re full too), fine, stay at Sports. If you have some event—sporting competitions often book rooms there—then don’t worry, you’ll have a fine time. Other than that, there’s really no reason to stay at Sports over Movies (if you can book a preferred room) or Pop Century. And if you’re torn between Music and Sports, Music is the easy choice. The truth is that Sports can be just be a little too busy. The first time we wandered over there to check it out from Music, it was hosting kids for some sort of sporting competition and it was a madhouse. During this visit, it wasn’t so bad. In a nutshell, Sports has everything we love about the value resorts—cheap food, fun theming, and big energy. It’s simply easily beat by the other value options. Since it doesn’t have refurbished rooms, has to least “Disney” theming of the All-Star resorts, and frequently plays host to large groups of unsupervised teenagers, we’re fine skipping Sports at all costs.